They look like me...but they are not...me. In spite of big numbers posted by Apple, Android smart phones outpaced iPhone during 1Q2012, more than doubling Google's market-share in some countries. Meanwhile, Windows Phone has made some long-promised gains, the most notable being in Germany (6% share, + 3 pts.). Microsoft's mobile platform now sits at 3-4% share in the United States, France, Italy and Great Britain (United Kingdom). Figures are for smart phones ('smartphones'), only, during the 12-week period ending March 18, 2012. Parenthetical amounts show change as +/-, for increase/decrease. So, where did Android phones find the extra share-points? As previously, they took it from Nokia's Symbian (down 6 to 36 points in every country) and BlackBerry, with RiM's phones plummeting from a 9% worldwide market-share down to just 3%. 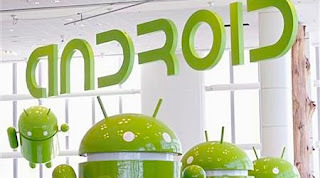 Interestingly, the report shows Android smartphones now dominate the UK market. During Q1, Android outsold iPhone by a huge margin: 49.9% to 18.5%. Samsung and HTC split 86% of all UK Android sales, while Sony and LG models lag well behind.